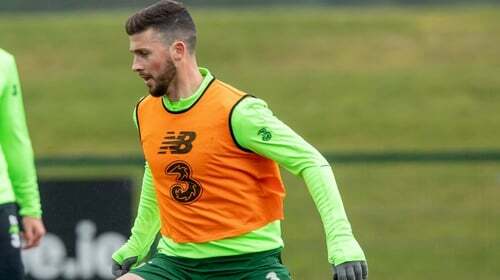 Richard Keogh will play with a broken finger in the Republic of Ireland's Euro 2020 qualifier in Gibraltar on Saturday, but Shane Long is out of Mick McCarthy's first two games in charge. The Southampton striker aggravated a groin injury during training on Monday and will now miss Ireland's European qualifiers against Gibraltar and Georgia. Millwall attacker Aiden O'Brien, who scored in their FA Cup quarter-final defeat to Brighton on Saturday, has been called up in his place. There's better news elsewhere however as Keogh revealed that he will play through the pain barrier to make himself available against Gibraltar. The Derby man suffered the injury in the weekend clash with Stoke but played on, before an X-ray afterwards confirmed the break. Keogh is confident it will hold up, and will wear a protective cast at Victoria Stadium should he be selected. "I did a bit of DIY and got through the game," he said on Tuesday, brandishing a plaster on his right hand. "I went for the X-ray and at first they were talking about surgery. This was before I spoke to the hand surgeon and I didn't particularly want to do that. "He saw the X-ray and said, 'I think we can do that'. If it hadn't been the middle of my finger where it's protected by the other two, I think I might have had to have surgery and been out for a bit. Seamus Coleman, Sean Maguire, Kieran Westwood and Shane Duffy all took part in full training in Dublin today. Aston Villa's Conor Hourihane will arrive in camp later this evening after his wife had a baby at the weekend. Keogh is hoping the side can hit the ground running after a dreadful 2018 that ultimately cost Martin O'Neill his job. McCarthy's arrival has given the players a shot in the arm, according to the veteran defender. Now, it's time to get down to business. "Listen, the way it ended last year for us, it wasn't a great year, I think we can all hold our hands up to that," Keogh added. "As players, we have got to take responsibility. We could have performed a lot better.